I have looked in the books for Great Britain and the United States. I had thought that the rest were inaccessible to me, or I would have tried to get them. It seems I was using the wrong keywords on WorldCat; the author plus "Petrarca" gets me there. Several are at libraries not far from me. I will see what I can get from Interlibrary Loan, and when they won't lend them, try to fit the libraries into my travel plans. If anyone else has access to particular books and wants to do a report on what they find, let me know and I won't do it. In this post I will give a summary of what I've reported so far, scattered in posts in various threads, with links to the original posts for details. One, #62, is definitely the 1430s or earlier: Venice, then Ferrara. Two, #4 and #22, are from 1450. No specific city in Italy. Two, #12 and #51, are from the 1460s. Three, #5, #32, #66. and #93, are from c. 1470. Seven, #1, #6, #11, #16, #20, #23, and #91 are from the 1480s. He also did a small a book with Michael Jasenas, Petrarch in America; a survey of Petrarchan manuscripts, 1974. I looked at it once, I don't think it had anything relevant not in his article, later incorporated into Ullman. There is also Dutschke, Petrarch Manuscripts in the United States, 1986. I looked at it and found nothing pertaining to the Trionfi not in Ullman. So far, the "spike" seems to occur around 1450. But all of this is very tentative. Just as the book on the British Isles has vastly more manuscripts than those for the U.S., I expect that the one for France will exceed that for Britain. There are also ones for Spain, Belgium, Switzerland, West Germany, and Leningrad. Italy does not seem to have a single book with one inventory; there is one for Trieste, two for the Vatican (one in French, the other in Italian from 1908), and two for Florence. I will see what I can get. Some illustrations of Petrarchan Triumphs are in manuscripts of the Canzione. There is one, 1414 Padua, that has what appears to be a Triumph of Death or Fame, I discuss it at viewtopic.php?f=11&t=858&p=13428&hilit=Wilkins#p13428. In the same post I discuss a copy of Sonnetti, Triunfi that Avril says is from Padua or Venice of the 1st quarter of the 15th century, assigned to Crostoforo Cortese, active from 1409 to 1440. This seems to be included in Pelegrin's inventory of Petrarch manuscripts in France. The Newberry Library here in Chicago has an excellent collection of rare books, particuarly for the Medieval and Renaissance periods (http://www.newberry.org/medieval-renais ... rn-studies). It's not manuscripts I am looking for, but books printed in the second half of the 20th century with comprehensive information about Petrarch manuscripts in particular countries' collections. Indeed, the Newberry Library has many if not most of the books I am looking for. For example, it has I codici del Petrarca nel Belgio, by Tournoy and Jsewijn. That is one I have not asked for yet. If you can take pictures of all the pages that describe manuscripts that contain all or part of the Trionfi done before 1500, that would be great. The same for Villar, Códices petrarquescos en España, which is also there. And the catalogs for the Florentine exhibitions of Petrarch manuscripts, listed in Trapp, http://1.bp.blogspot.com/-2577vHFvBIc/U ... Trapp2.jpg. These are codici latini del petrarca nelle biblioteche fiorentinei (probably not many, but perhaps included with his Latin works) and Mostra di codici petrarcheschi laurenziani. Firenze, maggio-ottobre 1974. Worldcat says they are both at the Newberry. Let me know which ones you choose, so I won't try to get them. I've requested three of the books listed by Trapp from Interlibrary Loan: the two by Pellegrin and the one on Switzerland. But I'm only allowed 5 books at a time, including both requests and ones checked out, so I didn't want to use them all up on just that one project. I am pretty sure I can get the one from West Germany, for example, since it's at the U of Oregon. Gemma Guerrini, I “Trionfi” del Petrarca. Scrittura e civiltà, 10 (1986) 121-197. ... claiming, that this work has been done already by Italian researchers. Perhaps you should get this first. "a long list of manuscripts and catalogues (!!) of manuscripts"
Huck: thanks, I will try to get a copy of the article via Interlibrary Loan, pending my query below to Phaeded. I see that Guerrini's article is listed by Trapp, under the title "Il systema di communicazione di un 'corpus' di manuscritti quattrocentische: I 'Trionfi' del Petrarca". The journal volume and page numbers are the same. Trapp calls it "a sophisticated survey of textual relationships for the Trionfi". It didn't occur to me that all the 15th century manuscripts might be listed, by date and place. I certainly hope so! I see from WorldCat that Guerrini also has an article, "Per uno studio sulla diffusione manoscritta dei Trionfi di Petrarca nella Roma del 15. secolo" in another journal that is in a library in Portland. Hopefully I'll be able to access it. Phaeded: I see that both Newberry and the University of Chicago, and maybe Northwestern, have the journal that Franco indicates, for the requisite volume. Perhaps that takes priority, as it may take both money and time for a library to send me a copy the article via an Interlibrary Loan request. For other things, they just have to send books. I have already received two of the three volumes that I requested a week ago. Switzerland, according to the book on that country, has no copies of the Trionfi whatever. #21 is "Parch., XVe s. (début)" and of script "préhumanistique ronde". It is from the Fabio Chigi collection. It contains both the Rime and the Trionfi, on parchment. On three folios the initials are illuminated by leaves of acanthus on a gold background (fonde). The title of the first sonnet is in gold letters. There is a marginal commentary in the same hand. Italienne, écriture humanistique cursive peu soignée et peu lisible. Le copiste signe et date sa dopie de Venise, au f. 70v: "finito. Amen. Iscritto per Michele Marmi (?) (en marge, addition, peut-être de la même main: "de Lonicho") de Firenze in Vinegia del mese di giugnio 1441". which means: "Italian, humanistic cursive handwriting neat, little and difficult to read. The copyist signs and dates the copy of Venice, in f. 70v: ".. (?) Finished. Amen. Written by Michele Marmi (?) (in the margin, addition, perhaps in the same hand: "of Lonicho") of Florence in Vinegia in the month of June 1441". I don't know whether this should be attributed to Venice or Florence. It is from the Chigi collection; there is also "E. Mange" (?) written in pen from the XVIth century. It contains both the Trionfi and the Rime. The rest are uninformative for our purpose, but I enumerate them anyway. #69 has "Papier sauf ff. III et 33 feuillets de garde en parchemin, XVe et XVIe". For the Trionfi, she has "f. III et 33-33v (add. du XVIe s.)"
#62 has "Papier sauf 11, 34-35, 46, 58. 79, 89, 100, 111 et 122 en parchemin (pas de filigrane visible), fin XVe s. ou XVe-XVIe s." The Trionfi are on pp. 112-122. #57 is "Papier (filigrane var. briquet 11705? ), XVe s." with Venetian style humanistic script, initials in style of Ferrara. #49 is "Parch. XVe s.", of "humanistique ronde" script. She says "aux ff. 21 t 47 intiales d'or a 'brianchi girari'," which might possibly be a clue of some sort. #45 is "Parch. XVe-XVI s."humanistique cursive penchee" script. #44 is "Parch., XVe s.", script "petite humanistique ronde" on parchment, only selections of Trionfi along with other things. #22 is "Papier (filigrane Briquet 11703; Vicence 1442), XVe s.", script "humanistique ronde". "Ex-libris contemporain au f. 141v 'Liber mey Antonii M[agist]ri' (?) Augustini de Martiis". #18 is "Parch. XVe s.", script "humanistique ronde". A possessor was "Io Bargolomio de Iacopo de Luerca (? ou Luesxca? ), (fin XVe s.)". #16 is "Parch. XVe s.", arms added of "famille Nelli de Sienne" [Nelli of Siena], "humanistique cursive" script. #14 is "Parch., XVe s.", lots of illuminations, including one on f. 10 of Laura, Petrarch, and Love. Has arms of Lucalberti family of Florence and an inscription "Questo libro e di P[ier]o di Pazzino Luchalberti citadino fiorentino e di Luchalberto suo fig[lio]lo" (XVIe s.). Script "humanistique cursive". For now I will focus on getting just things published after 1986. On Trapp's list, Belgium is 1988 and Spain is 1995. The "Codice latini" in Florence is 1991. So don't worry about Belgium, Phaeded, that book is in plenty of libraries. Just get the article, that will be enough (at 50 pages! ), at least for now. Xeroxing may be better than photographing, because I will want to run it through an OCR program. But then you would have 25 xerox pages to deal with. So use your own judgment. I have now looked briefly at Gemma Guerrini, I “Trionfi” del Petrarca. Scrittura e civiltà 10 (1986) 121-197, at least the long list (although I still haven't tried translating the article itself). The article includes no information about where or when manuscripts were done, only where they are now located. And of course it doesn't include manuscripts not done in Italy. Its usefulness is only in telling me where the information I want might be, and how much I have left to do to get a representative sample. It lists 434 Trionfi manuscripts. Of these, 111 are in Florence, mostly in 3 libraries, plus 3 now lost; 66 are in Rome, in 2 libraries; 16 in Venice; 16 in Milan; 14 in Parma; 10 in Modena; 10 in Trieste; 9 in Bologna; 7 in Naples and about 20 elsewhere in Italy. So that's 282 out of 434 I haven't looked at the relevant information for, probably the 282 most important. I don't think I have to bother with Russia (2), Germany (2), Austria (2), and other countries (4 or so), unless I want to know how popular the work was in those countries in translation when. Germany might be interesting in that regard, to see if it is like Spain outside Aragonese territory. It should be. I've already done I've already done the US, Britain, France, Spain, and Belgium, but that's not even a third of those out there. Florence has almost as many as all those places put together. mikeh wrote: It lists 434 Trionfi manuscripts. Of these, 111 are in Florence, mostly in 3 libraries, plus 3 now lost; 66 are in Rome, in 2 libraries; 16 in Venice; 16 in Milan; 14 in Parma; 10 in Modena; 10 in Trieste; 9 in Bologna; 7 in Naples and about 20 elsewhere in Italy. So that's 282 out of 434 I haven't looked at the relevant information for, probably the 282 most important. I don't think I have to bother with Russia (2), Germany (2), Austria (2), and other countries (4 or so), unless I want to know how popular the work was in those countries in translation when. Germany might be interesting in that regard, to see if it is like Spain outside Aragonese territory. It should be. I've already done I've already done the US, Britain, France, Spain, and Belgium, but that's not even a third of those out there. Florence has almost as many as all those places put together. If the number 111 in Florence and 66 in Rome let one conclude, that at least a similar number of these was produced in Florence and that perhaps a great number of the Rome manuscripts were also made in Florence, we somehow strand in the simple recognition, that "Trionfi" of Petrarca should have been a Florentine speciality. Which shouldn't be a wonder, if we consider the 1440s interest in Cassone productions. Naturally it might be, that these clear pro-Florence numbers depend for a part on the condition, that Trionfi-manuscripts were collected just by later Florentine libraries and museums. Well, these numbers don't allow a clear picture of the development, when the editions are not connected to some time. What we actually really need is the overview about the number of activities before 1440. I have managed to get from Interlibrary Loan the book Mostra di Codici Petarcheschi Laurenziani. Firenz3 1974, a catalog of an exhibition of manuscripts of or about Petrarch, 93 in all. The preface (and may I assume the book) is by Antonetta Morandini. The notes on the manuscripts are conveniently divided into non-illuminated and illuminated. Huck, only one is dated pre-1440, no. 64. Of some interest might be that it has Death before Love, not the same disorder as in the tarot (Time before Death. which one would hope to be truer), but still a disorder. Perhaps it is an autobiographical comment by the copyist. Fortunately, he seems to have survived his ordeal (which in fact involved more than just copying Petrarch). Huck, you might also find no. 63 of interest. 53. With Rime. They comment: "Scritto di una mano della prima meta del secolo XV con giunte finali di piu tarde", i. first half of the xvth century or a little later. 62. Trionfi con varianti e note d'Autore. 18 June 1463. The Triumph of Fame is preceded by the chapter "Nel cor pien d'amarissa dolcezza". 64. Trionfi, 12 Mai, 1427. Disordered and incomplete. The second chapter of the Triumph of Death--the only one present--is put before the Triumph of Love. Then come Chastity, chapter 1 only, followed by Fame, Time, and Eternity. Copied by Gabriele di Francesco as an involuntary guest of Florence ("durante la sua detenzione nel carcere fiorentiono delle Stinche" as it says on 35). 65. Trionfi, xv century. Hand resembles that of Barolmeo Sanvito. 85. Trionfi, xv century. "ambiente fiorentino". In case anyone can date by artistic style, I give my scan from it of Petrarch in his scriptorium. I don't know how they get Galeazzo Maria out of "IA AD", but the dragon on certainly resembles the Visconti snake. 88. Trionfi and Divine Comedy, 1442, finished at the vigil of the Ascension of Christ. At the beginning of each Triumph, traditional iconography. Script by "Bese Ardingheghli fiorentino". 91. Trionfi. "Splendida" Triumph of Love and portrait of Petrarch on p. 1-2, attributed to Francesco d'Atonio del Chierico. 92. Trionfi, 15th c., Florentine ambit. Then come various Triumphs, in an interpretation "che si discosta leggermente da quella classica ed offre notevole interesse anche per la storia del costume", i.e. that deviates slightly from the classical and offers noteworthy interest for the history of dress. I don't know if we got a comphrensive view of this subject, but Simona Cohen seems to have done this work for us. Can you get this book in your library, Mike? 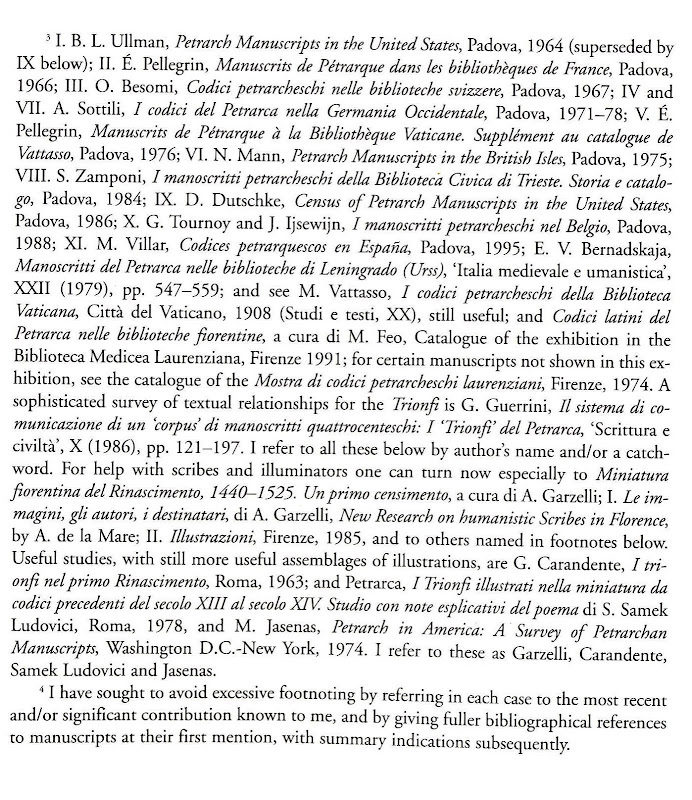 Appendix I "Catalogue of Illuminated Manuscripts of Petrarch’s Trionfi Located in European and American Collections"
Judging by her use of it in the chapter on the iconography of Time (similar to her 2000 paper, much discussed here), it promises to be an exhaustive and definitive list.